KTMtwins.com KTM Motorcycle and Product News: CRG Levers are now available for your Super Duke, RC8, 690 Duke and 990 Supermoto! CRG Levers are now available for your Super Duke, RC8, 690 Duke and 990 Supermoto! We are proud to announce the introduction of CRG Levers to our lineup. We have sold numerous sets of their mirrors and love all of their products. With 6 position lever adjustment and your choice of standard or shorty length you have all of the makings for a custom fit. All you have to decide on with their standard lever is which of the three colors you want. 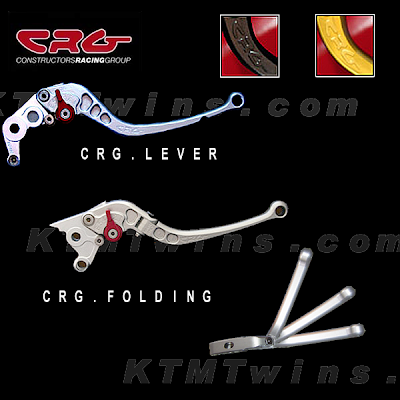 If you are looking for the ultimate in CRG's line up choose the MotoGp inspired folding lever. Your choice of two different anodized colors and the security that your lever will be there after a spill is definitely worth the extra cash in our opinion. Keep an eye out for them on our site shortly. KTM 950 Super Enduro Safari Tanks now in stock!